The project challenge was to design a module to provide a strong and effective workflow both for internal and customer support departments. This is essentially a fully featured Ticket Management system that helps its users keep track of, attend to, and reassign the tickets to appropriate departments or organizations. The project was split into two parts, Service Desk Server and Service Desk Mobile. Extended such features as Time Calculation, Knowledge Base, Time Sheets, Calendar, and Resource utilization. Browse Billable Time and Cast statistics. In the end, the project resulted in an exceedingly agile and functional platform able to simplify the workflow both for our client and its customers. The Admin panel allows the administrators to configure preferences for the following components: Tickets, Mail, Access, Alerts and Notices, Help Topics, Ticket Filters, SLA Plans and Forms. The administrators are given the option to assign and reassign tickets as well as generate reports. Here, they determine how the system should function. 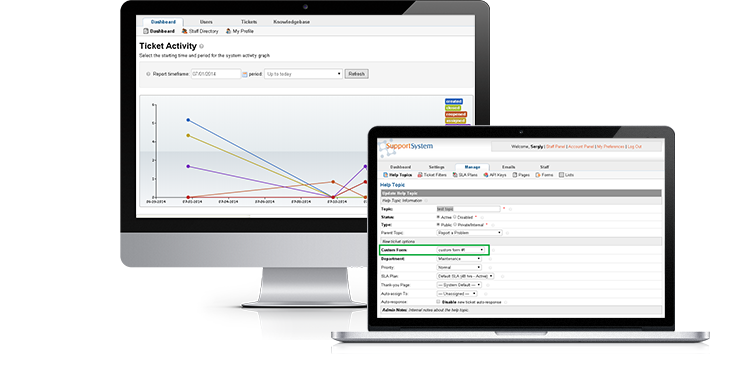 The Staff Panel allows agents to manage assigned tickets, search or filter tickets according to ticket’s number (Simple Ticket Search) or key words (Advanced Ticket Search), use Stopwatch function, edit organizations, create new users, manage knowledge base items and generate reports. Furthermore, the Mobile Application allows the staff to see their customers’ location on interactive map and capture and attach photo to internal notes.